Hi. 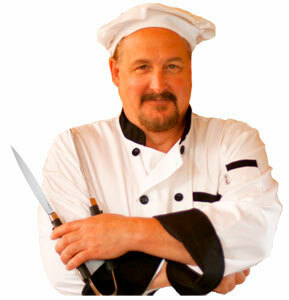 Chef Dave Caron here. It’s likely, since you found this page, that you’ve already purchased my barbecue grill mats. This page provides detailed instructions on the use of my grill mat. These are the highest quality available and will give you extended service if you care for them correctly. If you got here by accident, you can research barbecue grill mats on this site and gather more information – if you need to before making a purchase. Grill mats don’t look like much, just a big rectangle of black PTFE fabric, but think of them as nonstick pans that you can roll up – and can even cut into different sizes (more on that later). Treat them with the same care that you would an expensive Teflon™ pan. But keep in mind, they definitely have some advantages over traditional nonstick cookware in that both sides are equally usable — and there’s the thing about rolling them up, too. All nonstick products on the market today are made from some form of polytetrafluoroethylene, which is also called PTFE, and consequently all nonstick cookware, grill mats included, follow the same rules of chemistry. Mats made from PTFE fabric provide a reliable and safe nonstick cookware solution, provided you follow the instructions: this includes using your grilling mats only at temperatures below 500 degrees Fahrenheit. This is not our rule, it comes from the FDA. The maximum temperature for using grill mats is 500˚F, in compliance with FDA Regulation (EC) No.1935/2004 and FDA Regulation (EC) No. 2023/2006. You’ve probably see those ads for the “revolutionary new military or industrial grade mats usable up to 600˚F. What’s the deal with those? Are they lying to you? Yes, they are. But that doesn’t matter because you bought the best available. 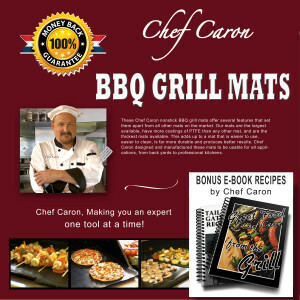 Rest assured, if it were possible to produce grilling mats that could withstand higher temperatures, Chef Caron would have made one! These three features alone exceed the specifications of every other barbecue grill mat, including the Miracle mat and the Yoshi mat, just to name a couple of them. You’ll notice I like to pick on the As-Seen-On-TV grill mats but I explain all that in another post. Remove the grill mats from their box and wash them thoroughly with soap and water to remove any residue left over from manufacturing and packing. Or, if you prefer, you can put them in the dishwasher – on the top rack only. When washing grill mats by hand be sure NEVER to use any scratch pads or abrasive cleaners. It’s not necessary and will damage the PTFE coating. You can use a soft scrub pad to clean of pesky residue. If you’ve been grilling food that is particularly messy and you let it dry on the PTFE sheet, you can soak it for as long as needed in soapy water and then scrub it clean with a soft scrub pad. If you’ve got baked-on sauces you might need to rub a bit, but don’t succumb to the temptation to use the scratch pad. You can easily get a clean BBQ grill mat without resorting to those measures. Never use metal grill utensils on your barbecue grill mats. The techniques you’ll use with these are quite a bit different than what you’re used to when grilling food directly on the grates. 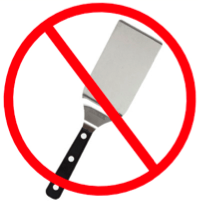 You’ll need a silicone-tipped pincer and a flexible plastic spatula. When shopping for your BBQ tools look for the “Safe Nonstick Cookware” label. They’ll have them at your favorite kitchen supply store. Most BBQ food can be flipped (or turned, if you prefer) with your nonstick tongs. 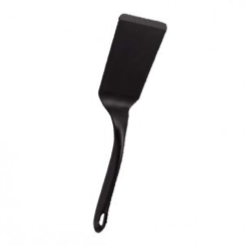 For loose foods like cut vegetables, eggs, pancakes and hash browns, you’ll secure the mat with the tongs, while manipulating the food with your spatula. 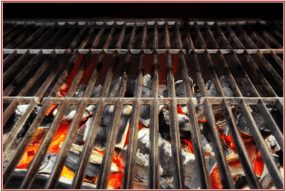 Chef Caron recommends barbecuing between 300˚ and 400˚F. 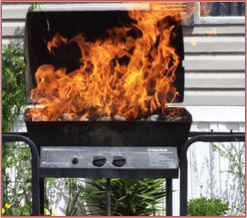 Barbecue grill mats cannot be in contact with an open flame and need to be far enough above an open heat source that they aren’t exposed to temperatures above 500 F. This is not a shortcoming of the product. It’s simple chemistry. PTFE will disintegrate at higher temperatures (626˚F). Heat your barbecue to around 350˚ and keep it there while cooking on the grill mats. This way you’ll get the best results. And you know what? The food will cook just as fast as if you were grilling on higher heats without the mats – and it’ll taste so much better! If you happen to be one of those anthropological throwbacks (we know you’re out there) that likes lots of flames, and needs to fire the grill up to 600˚, and loves it when the grease drops down and creates a small atomic explosion, then we suggest you leave the mats in the box and give them to a non-caveman type person as a gift . . . because you’ll ruin them and they’ll ruin all your fun, anyway. Otherwise, lay your mats on the grill, and you’re ready to go! When you’re finished cooking on the grill, go back to step one and clean the mats. You’ll notice when you lift them from the grates that they’ve left your BBQ grill cleaner than it would have been without them. It’s a popular feature. Chef Caron recommends you store them in the box they came in after they are completely dry. It will protect the PTFE material from getting scratched. After a few uses you may notice that the edges appear very slightly frayed in spots. This is just a few of the fiberglass fibers on the very edge of the mats poking out in response to being exposed to heat. This will happen with the first couple of uses. It doesn’t mean your grill mats are coming apart. You can trim off any dangling fibers with a sharp pair of scissors, sort of like giving your mats a haircut. Actually, the fibers are so tiny most people don’t notice them, but in case you do, the solution is just that simple. EGGS: Eggs are easy to cook on the mats. I use a little extra oil spray and you’ll need to make sure that your grill is level. I’m sure I don’t need to tell you why. You can also grill pancakes, hash browns, bacon, and pretty much anything you can imagine. TEMPERATURE: I’ve mentioned this before, but it’s the number one reason for poor grilling results. This is foremost among BBQ tips. Don’t overheat your grill! 400˚F tops! This is particularly important when using the barbecue grill mats. HOW THEY WORK: The barbecue grill mats rapidly absorb heat and distribute it across the surface of the mats. This quickly creates a perfectly even cooking surface. In this respect they are even better than non-stick pans. That’s why you’ll get good results on medium heat. The foods don’t overcook or cook too quickly and you’ll maximize the flavor in your food. MEAT: I don’t use the grill mats for traditional barbecue foods like red meat. It’s a personal preference. Even though I’m a huge fan of the grill mats, I prefer grilling steaks and hamburgers directly on the grates. You can cook meat on the mats, for sure, but it will take longer and the result is decidedly different than the traditional way of grilling them. For me the barbecue grill mats are a phenomenal solution for those foods we didn’t used to be able to grill, that were never before considered to be BBQ foods. Cooking fish on the grill has always been a problem. With the grill mats you’ll be able to do it easily with great results. 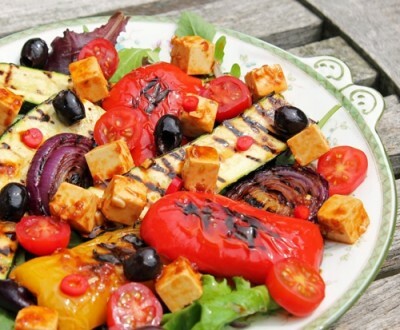 The barbecue grill mats have become enormously popular with vegans and vegetarians because they simplify the process of grilling vegetables in any shape or form. I love them for grilling camping and breakfast foods. They’re so much easier to use for outdoor cooking than a cast iron griddle. And anyway, I like pancakes with grill marks on them. Here are a few of the ways I’ve used the grill mats, along with a couple of suggestions I gotten from satisfied customers. Once you start using these grilling mats, you’ll start thinking of all sorts of great BBQ ideas yourself. Oven liner – eliminates having to clean the oven. Chef Caron barbecue grill mats can be used for any application that requires Teflon paper or any other type of PTFE sheet including all nonstick flexible cookware such as a Teflon sheet or PTFE fabric.